House in prestigious area of Riga. 2 floors + 66sq.m of groundfloor. Ground 1776sq.m. 5 rooms: 3 bedrooms on 2nd floor; living room, kitchen, 2 toilets and bathroom. Garage for 2 cars. Gas heating. Russian `sauna`. Satelite, alarm. 15 min to Riga centre. 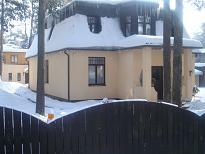 Property located not far from Zoo, Swimming Pool, Shop and Restaurant. I can send pictures by e-mail.